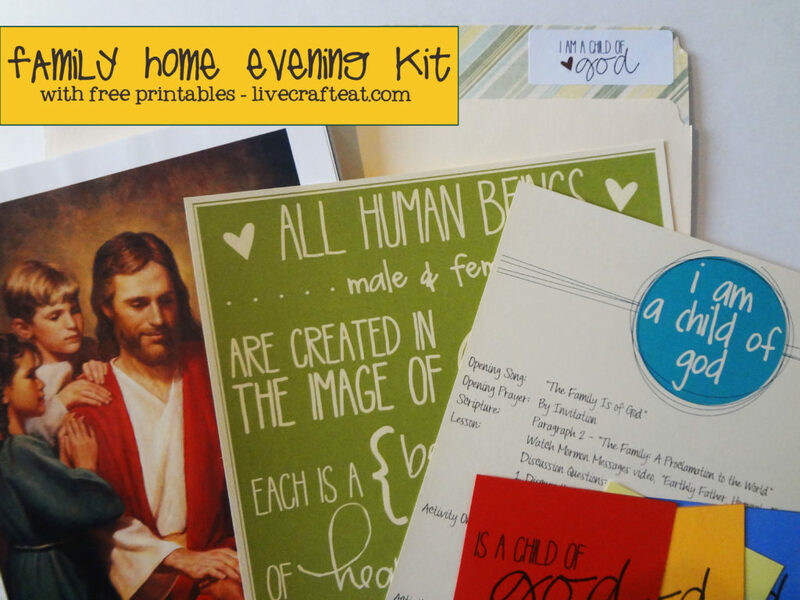 alright everyone – here’s a new family home evening kit! 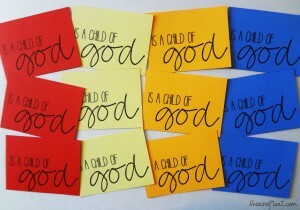 the 2013 theme in primary is “i am a child of god” and since we like to try and match up our fhe’s with what our kids are learning in primary, we’re going to do the same topic for this fhe kit – i am a child of god!! if you’re not sure how to put a family home evening kit together, or you need a refresher, you can visit my post on how to make a family home evening kit. on that post there are also printables for the fhe kit: “understanding those who are different,” and if you’re looking for an fhe kit on gratitude, i’ve got one here too. 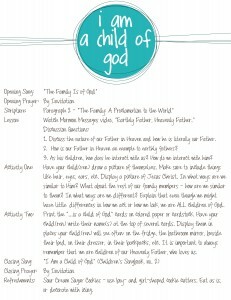 ok, now on to the i am a child of god fhe kit! 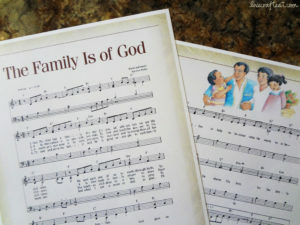 for the opening song, you’ll need to download the music for the family is of god from the friend magazine. (it’s pages 28 & 29 in the magazine but with my printer settings i had to print pages 30 & 31.) OR if you don’t have a piano you can do what i did and download the instrumental version (with or without vocals) here – just scroll down to the bottom where is says the song title and click the icon on the right. for the lesson: this mormon messages video is one i just saw recently – and it is fabulous! i love, love, love it! it talks about what a father does and how he thinks about his children, provides for them, protects them, etc even if they don’t realize it, and then relates it to how our father in heaven does the same for us even if we may not realize it. so for the lesson portion of this family home evening kit, i’d suggest watching this video and talking about how the role of a father here on earth is like that of our heavenly father’s (see outline). activity one: i love seeing the pictures kids draw of themselves! here’s one that my kid drew – he made sure to draw his tongue! so cute. 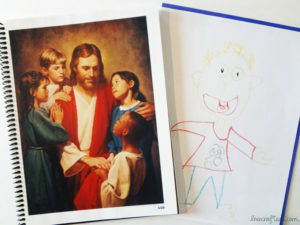 anyway, you’ll need paper and crayons OR a photo of your child(ren), as well as a picture of Jesus Christ. i just used one from the gospel art book. activity two: this one is fun, especially if your child is starting to learn how to write his/her name. they get to write their name on a bunch of cards that say, “…is a child of god.” and then think of all the different places they could post them where they’ll see them several times a day! download the cards here. closing song: i am a child of god, children’s hymnbook #2. if you want to make this song fun too, you can download this game i used in primary music time. see how many of the verses you can get right before singing them all! 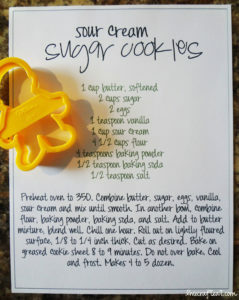 refreshments: sour cream sugar cookies! if you have boy or girl cookie cutters, they would be really fun to go along with this topic. i have made these many times and they always turn out perfectly! use your favorite icing and decorations to make them unique (just like each child of god)! i hope you and your family enjoy this family home evening kit! WOW!!!!!! Thank you so much for sharing your amazing work!!!! Thanks, Amber! I’m glad you like it 🙂 More to come! Yes, thank you!! I love your work! Thanks for posting this! I struggle with being organized for FHE and this is SO helpful. Dannielle, you’re not the only one! lol. That’s why FHE kits are awesome – you can do them WAY ahead of time! So on Monday nights when you’re probably pressed for time, it’s just waiting for you! Gotta love that. Thanks for your hard work! I just found your website and I LOVE it! I’ve been perusing for a while now. Thanks again! I absolutely love your lessons! Please post more of them!!!! My children are little and I work so it’s hard to find time to organize something this wonderful, but I really want to make FHE a priority in our home and you have everything ready it makes doing it after work possible for us! Thanks and we look forward to more of them from you! Thanks for sharing this! I just came across your page and love it! I’ll be coming back for more. Such wonderful ideas!!! This was a fantastic lesson! Our non-member granddaughter came to live with us and I needed to start with the basics. This was it! I loved the connection with our earthly fathers especially since Father’s Day is next Sunday. My missionary son had just told me Monday morning to use a Mormon Message, which is what I planned on doing anyway, and then yours already had it included so I didn’t have to find one. This really brought the Spirit into our home and our granddaughter seemed to really enjoy it too. Oh, this makes me so happy! Thanks for sharing, Niki! I’m so glad your granddaughter liked it 🙂 And you’re right – that is a GREAT Mormon Messages video 🙂 I love it! Thanks so much for sharing your work, both the ideas and the printables! Thank you so much for commenting and for visiting my blog!